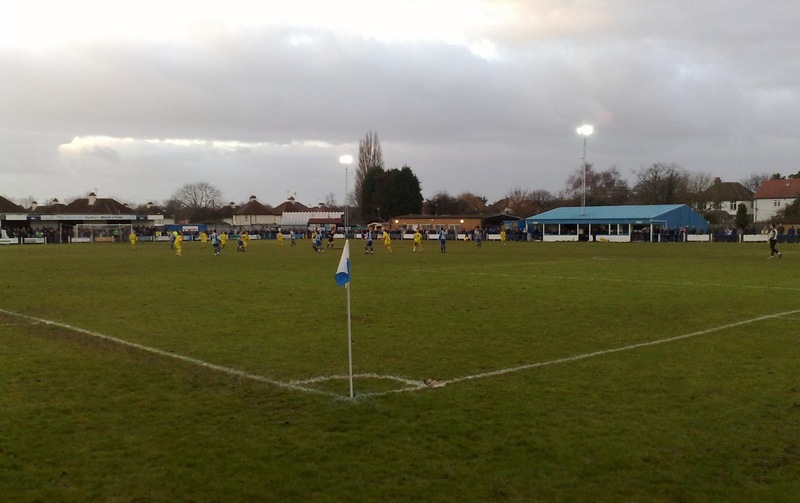 Two of my highlights of last season were our visits to Chertsey Town to see them play Plymouth Parkway and then Whitley Bay in the FA Vase. 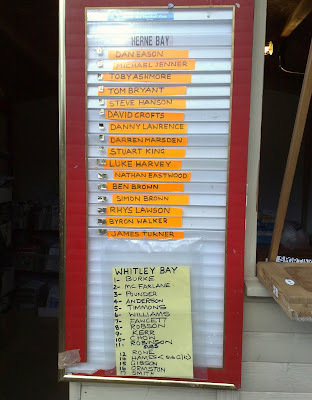 As mentioned in earlier posts on this blog, at the Chertsey vs Parkway game we met, both in the pub before/ after the game and at the ground, a Whitley Bay supporter called Mark who lives in Northwood, Middlesex. He was at the match in anticipation that his team would play away to the winner in the next round. We had enjoyed our visit (despite 'our' team - Parkway - having been thumped) and he seemed to be on our wavelength (attending a match between two teams he didn't support, with a beer never too far away) and so we agreed to meet with 'Northwood Mark' again, in the same pub, prior to the next round. 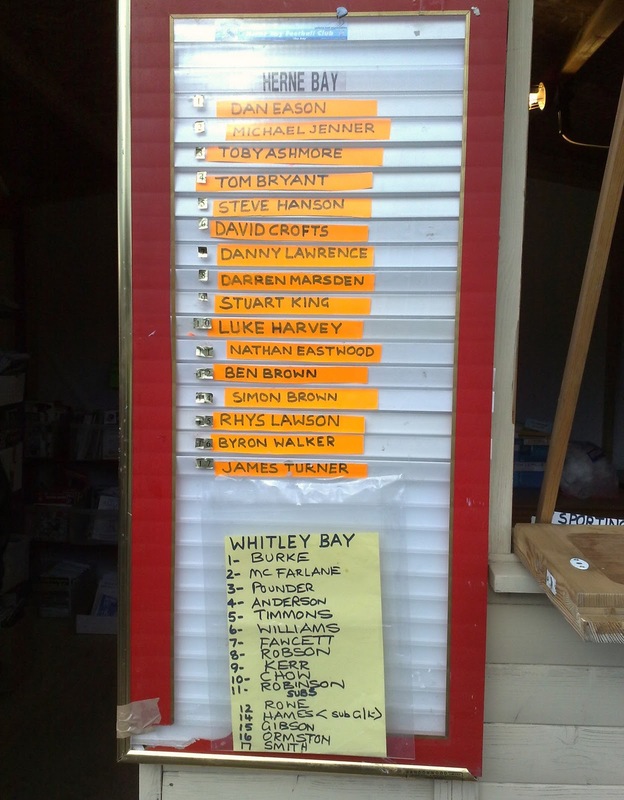 Whitley Bay eventually defeated Chertsey, after a replay, and made it all the way to the Final. We were there as they defeated Wroxham 6-1 at Wembley and were photographed with Bay manager Ian Chandler and the Vase trophy in a local pub after the game. Northwood Mark would also join us at a Maidenhead home game (as we clashed, some of us literally, with Chelmsford City) before the season was out. "We're the famous Maidenhead and we went to Whitley Bay"
In short, it's fair to say that we have a soft spot for the Bay, and their exploits away from home in the Vase (they're unbeaten in competition for over two years now) are ideal opportunities for us to meet with Northwood Mark (one day we'll get our backsides in gear and venture up for a home game). As such, when this season's 4th Round Draw was made in December and Whitley (or AFC Liverpool) were handed an away tie at either Colliers Wood United or Herne Bay, our interest was piqued. Steve H had been to Herne Bay (with former Maidenhead United Chairman Roger Coombs, and his wife Jean, now sponsors - I think - of Flackwell Heath) the previous season, seeing them lose 1-0 in the Vase to the aforementioned Heathens, and said that it looked like a decent day out. My parents and other United fans, who visited nearby Whitstable for an FA Cup tie in 2004, have also spoken favourably of this particular part of the world and so a 'Battle of the Bays' - between Herne and Whitley - was exactly what we were hoping for. 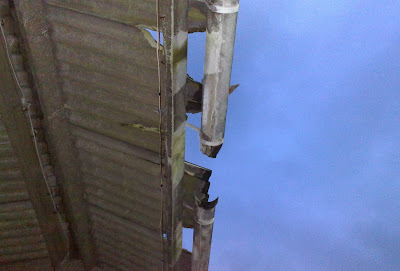 This very match-up was finally confirmed when, in early January and after several postponements, Whitley hammered a manager-less AFC Liverpool (profile and average attendance - 178 in the North West Counties League Division One last season - is surprisingly minuscule compared to other supporter-formed clubs such as AFC Wimbledon and FC United of Manchester). Train tickets (thanks, in part, to the Network Railcard) remained cheap, although when I first investigated the possible routes there were no trains from Maidenhead, via Victoria, to Herne Bay (they did become available a few days later, but Mark would confirm that they definitely weren't showing on thetrainline.com initially, for some reason, and so, much to my relief, I wasn't completely losing my marbles!). 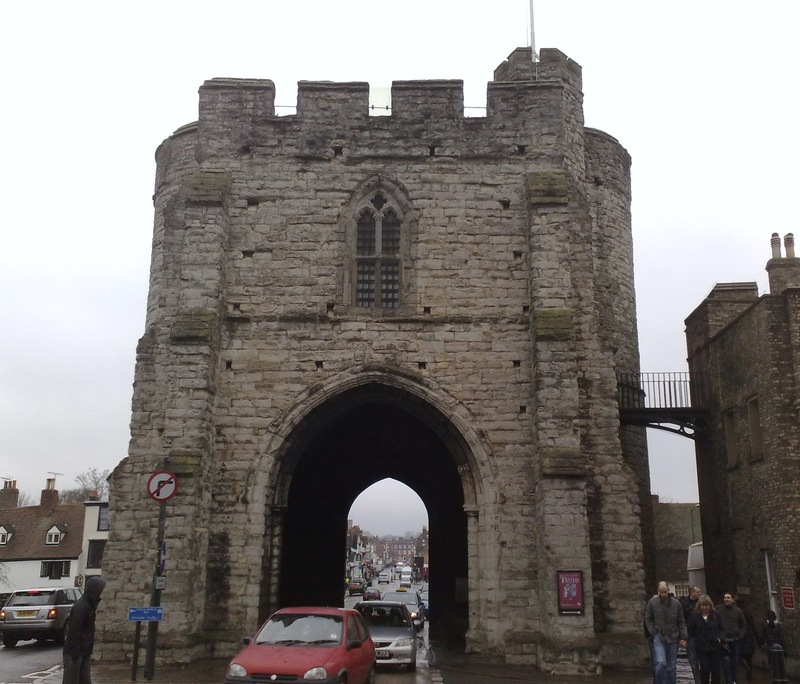 As it was, the alternative option was to get a fast train from St Pancras International to Canterbury West (the train between Victoria and Herne Bay was a slow one) and then embark on a 40-minute or so bus ride to Herne Bay. As we'd enjoyed our bus ride when visiting Cinderford earlier in the season, these tickets were quickly booked and I, for one, was very much looking forward the first KSG away day of the new year. Due to the relatively short notice of the fixture Macleod (M) was unavailable as he had already bought a ticket for Portsmouth vs Leeds (I, personally, reckon he should have sold this ticket to one of the many other late thirty/ early forty-something Maidonians who also have no family connections to Leeds but support the city's football club for one reason or another ... ) and so again there were only three of us making the trip. It was a cold, clear and crisp morning as we met in the Greyhound for sausage/ bacon rolls and coffee(!) before boarding the 10:02 Paddington-bound train minus a carry-out (Murdo would've had something to say about that, I suspect). On arrival in London we were informed that the District and Circle lines were closed for 'improvements' while the Victoria line was (temporarily) suspended, so good job we were going via St Pancras (and Canterbury), as opposed to via Victoria, after all. After arriving at St Pancras - re-built, over the last decade, at an reputed cost of £800M - Macleod (C) went for a cigarette (bumping into Tartan Army associate and TV guru Jim Brown; small world) while Steve and I went to purchase some refreshments for the next leg of the train journey. The terminus was modern, uncluttered, spacious and contained several retail outlets - ranging from Monsoon to Boots - but seemingly no off-licences or supermarkets. We balked at M&S' over-priced, own-brand Belgian lager and presumed/ hoped there would be a buffet bar on the 11:42 train to Canterbury West. There wasn't. Fortunately - and as aforementioned - this was a fast train (it was also inordinately long, virtually deserted, almost new and spotlessly clean), only stopping at Stratford, Ebbsfleet (boo!) and Ashford. The landscape, initially industrial, became ever more lush and picturesque as we went underneath a busy motorway (the M25?) and were transported deeper into the 'Garden of England'. 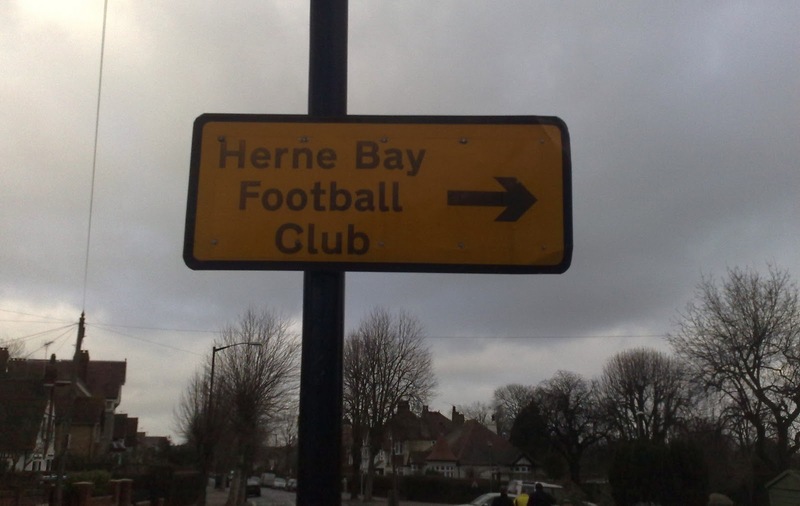 Posters on the Herne Bay FC forum had mentioned plenty of rainfall throughout the preceding week and the river(s) we passed on our approach to Canterbury certainly appeared swollen. It started to rain, albeit not heavily, as we exited the station and started our 10-minute or so walk through the city centre to catch the bus. 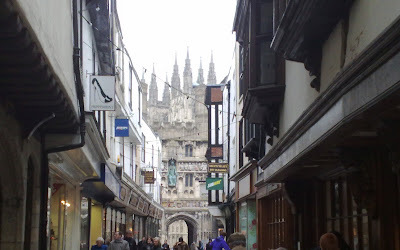 I had read that Canterbury was quite a lively place and my immediate impressions of the city were favourable. We passed countless pubs (the High Street - I'm not sure it was actually called that - reminded me of Weymouth, the side streets brought back memories of Bath, while the pubs appeared reminiscent, in character, to those on Worcester's Tything) and the shops/ restaurants (including Cafe Rouge and Zizzi's, amongst others) suggested a certain affluence. The shoppers, out and about on this Saturday lunchtime, seemed abnormally youthful and cosmopolitan, presumably due to the city's three universities. There were also plenty of tourists, unsurprising given the impressive medieval gatehouse - the Westgate (which resembled Lübeck's Holsten Gate) - and the world famous cathedral, which we were to walk past. 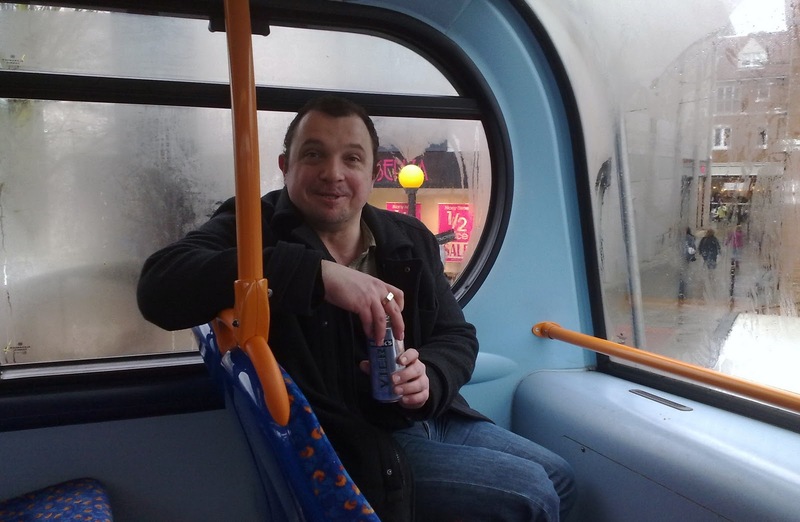 After finally getting our hands on some lager and pies from a Tesco Metro, conveniently located close to the bus station, we boarded the 13:10 No 6 bus that would take us the 7 miles or so north to Herne Bay. The tickets were, I thought, rather expensive (a fiver each for a return), the Becks Vier not chilled, the windows partly obscured by condensation and the traffic, out of the city, congested but soon we were winding through the villages of Sturry and Herne and the lively conversation (specifically Steve H attempting to defend Martin O'Neill's transfer dealings at Aston Villa - £12M for Stewart Downing?! £5M for James Collins?! £8M for Curtis Davies?! £5M for Steve Sidwell?! £5M for Luke Young?! £7.8M for Carlos Cuellar etc., etc., etc.) ensured that time flew by as quickly as the scenery. Soon the sea was in view and, just before 2pm, we disembarked the bus close to Herne Bay railway station and met with Nortwood Mark (Steve H would, on the bus, ask where Mark lived?!) in the nearby Heron pub (complete with a sign outside advertising their Christmas menu; Oranjeboom on tap, a small group of Whitley fans, a large group of Chavs with Staffordshire bull terriers straining on leads, a professional-looking dartboard and landlord whom - after bemoaning the increased cost of Sky - gave us directions to the only pub in town with satellite TV, so we would be able to watch the Villa vs Mansour City game later on). It was a short walk to the - unlike York Road - clearly sign-posted ground. Mark remarked that the location and entrance reminded him of Colston Avenue, Carshalton Athletic's ground, and I would concur with this. 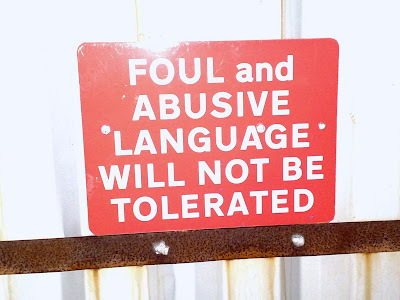 After taking photos of some bizarre signs (see below) and paying our entrance fees (£6) we joined the 650-odd other paying customers, literally just in time for kick-off. Both teams home colours are blue and white stripes and so it was difficult to judge how many the northern Bay had brought down, as many were wearing their replica home shirts as opposed to the yellow that the team (and Mark) were in. Indeed, confusion reigned supreme as there seemed to be some Whitley fans behind the 'wrong' goal, first half. Trouble was never on the cards, however, as it soon became apparent that the noisy home support (seemingly made up of 15 or so teenagers, resplendent in newly-purchased replica shirts) had seated themselves in a covered stand to the side of the pitch. 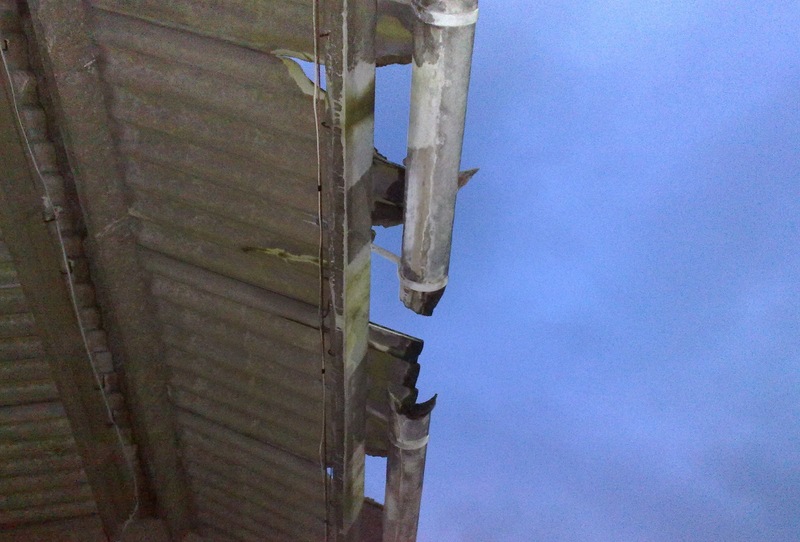 I liked the ground; both ends were covered (albeit just about - the guttering behind the goal Whitley were attacking in the second half isn't going to last very much longer) and there were grassed open spaces aplenty (which reminded me, somewhat, of M@rlow's Joke Tree Road). 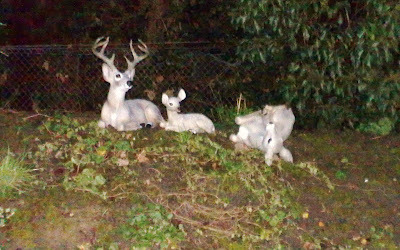 Darkness had quickly fallen and the weak floodlights made little difference to the impending gloom. There seemed to be fewer Whitley Bay fans behind the goal this half (although that may have been my imagination) and they didn't seem to be as closely congregated together as they had been at Chertsey, for example. 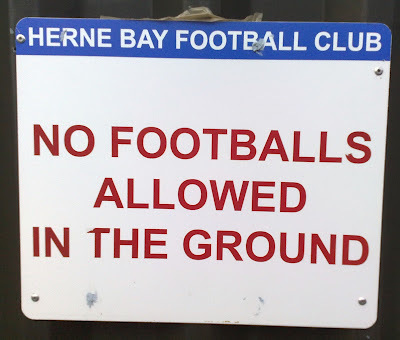 They also weren't as noisy as the home side (props to the Herne Bay Youth, who were an excitable bunch), although this might have been explained by the blue and white-shirted former Tonbridge Angels defender, Tom Bryant, sliding in to score from close range. Immediately after this - and then towards the very end - Whitley dominated and appeared the better side, but never really looked like scoring, seemingly bereft of ideas in the final third and, unlike on the occasions we had seen them last season, more than a little flat. Herne Bay weren't offering much either - although substitute Byron Walker added some pace and purposeful running with the ball - but they were working noticeably hard for each other. While some of the clearances from both sides' centre halves were, at times, rather hurried and 'agricultural' (think Steve Croxford, Maidenhead fans), both teams deserve credit for providing a thoroughly watch-able and entertaining game of Cup football on a difficult pitch. After joyously learning of Arsenal's comfortable win over Wigan, and that Bristol Rovers had won for the first time since October (and for the first time under new manager Dave Penney), we soon found the only pub in Herne Bay with satellite TV - the Bandstand - thanks to the directions given by the landlord of the Heron. 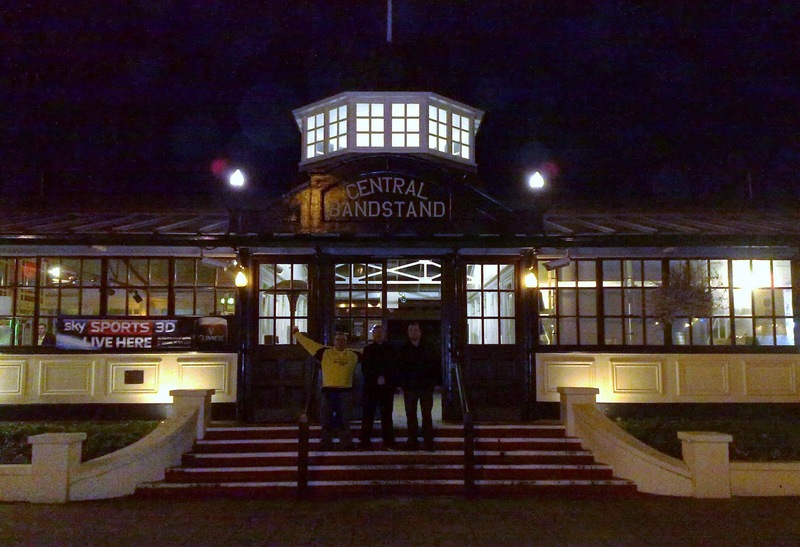 It was a rather peculiar place, on the sea front (the view of which was affected by nightfall), but had a certain charm and - importantly for us - more than enough HD TV screens showing ESPN and the Villa game. As Steve rejoiced at Darren Bent's debut goal, I flicked through Mark's commemorative match-day programme (not much of interest, TBH, aside from the list of previous Vase winners) before he departed at halftime (for his return train to Victoria). 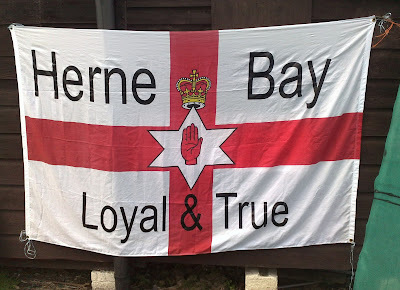 It was during the second half, as the 'Martin O'Neill is a w@nker who wasted millions and was rightly denied further transfer funds by Randy Lerner' debate resurfaced, that I was to receive a phone call from Mark rhetorically asking the score of today's Herne Bay vs Whitley Bay game. When he announced that it wasn't, as we had previously understood, 1-1 my immediate thought was that it had, after all, gone to extra-time and that we'd subsequently missed a winner. 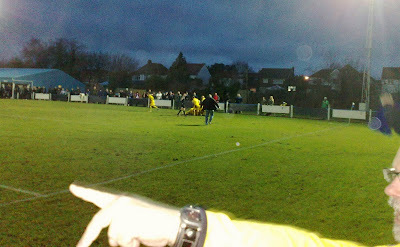 It transpired that Herne Bay's goal hadn't opened the scoring and, in fact, Whitley had scored first, shortly after halftime. Reading the match report on kentishfootball.co.uk it becomes apparent that we weren't the only ones to miss Whitley's first goal; the difference between us the Herne Bay manager is, of course, that he found about it soon after and knew that Chow's 93rd minute strike had won Whitley the game, rather than saved it for them! Not the first (or, no doubt, the last) time that I've missed a goal, but certainly the first time that I've missed one and not learnt about it before the final whistle! Embarrassing, but at least I wasn't the only one! "1-1, you think the score's 1-1 ... "
We'd learnt our lesson - re return bus journeys, when there is a train to catch - following Cinderford vs Maidenhead earlier in the season and so I booked a taxi (in the name of Martin O'Neill) and we were back in Canterbury in time for a bite to eat (Callum and I felt compelled to have fish and chips - as we had, for a time at least, been by the seaside earlier - while Steve H demolished a meat doner, in the kebab house opposite the Westgate). The Wetherspoon's pub next door to the kebab house was huge and absolutely heaving but, as aforementioned, Canterbury is not short of a pub or two and so we were able to select one nearer the train station; the Unicorn (similarly busy) gets the seal of approval (not least by Steve H, if only because it served Doom Bar). After another carry-out and snacks from a local convenience store we were able to catch the 21:25 with time to spare (which is a rarity for us, these days). The 23:13 from Paddington was packed to the rafters (word of warning: don't sit/ stand anywhere near Steve H, on a crowded train, after he has eaten a kebab) and we found ourselves in the same carriage as Anchor regular 'Pervy Bob', on his way back from a TV shoot (where, as an extra, he had been playing a judge in a courtroom drama). It transpires that he is to appear as Nikita Khrushchev the the new X-Men film - not everyday that you get to sit on a train home next to a former Soviet President! In summary, a top day out (as expected). 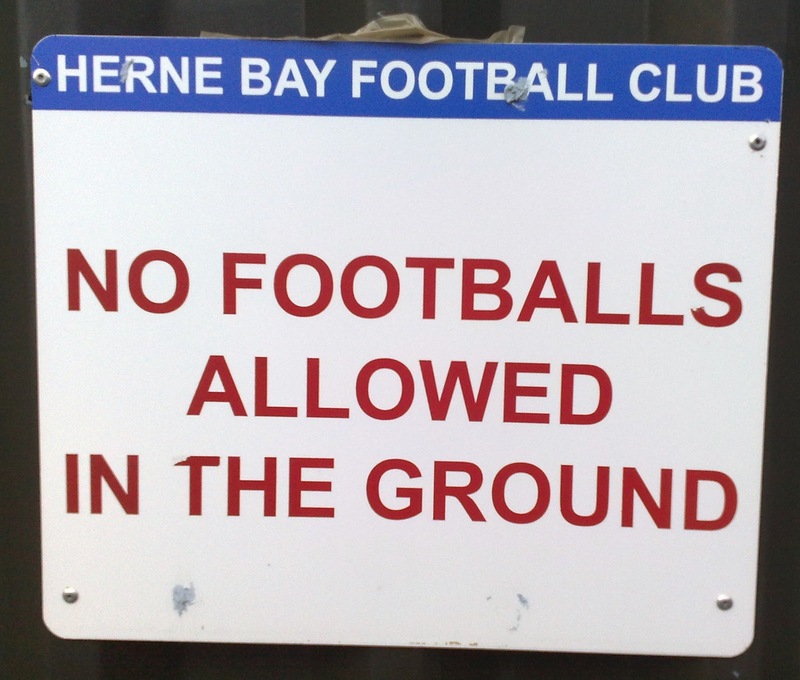 I liked Herne Bay's ground, enjoyed the football and the celebrations that followed Chow's winner (not that we knew it was a winner at the time, despite it's proximity to the final whistle!). 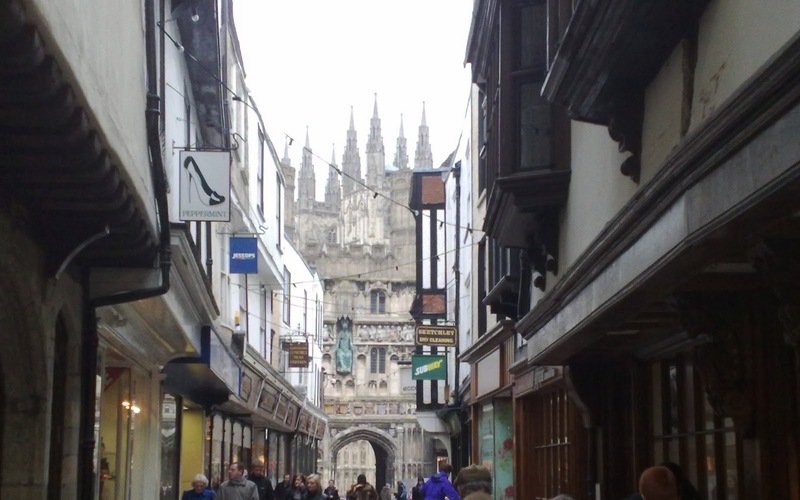 It was also good to meet once again with Northwood Mark and to visit Canterbury for the first time. Wikipedia suggests that the city's football team did well in the Southern League during the 60s and 70s but endured financial problems and relegation in the 90s, before folding in 2001. 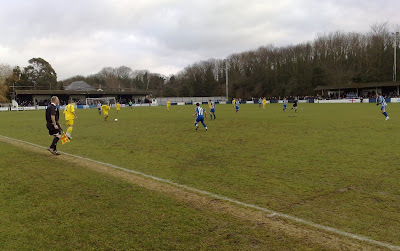 The club re-formed in 2006, based in the nearby village of Hersden, and now plays in the Kent County League. Our fixture list for the rest of the season is pretty packed (with games at North Leigh, Ascot United, Dartford and Berwick upcoming) so I will instead keep an eye out, next season, for possible Canterbury City home games to attend. 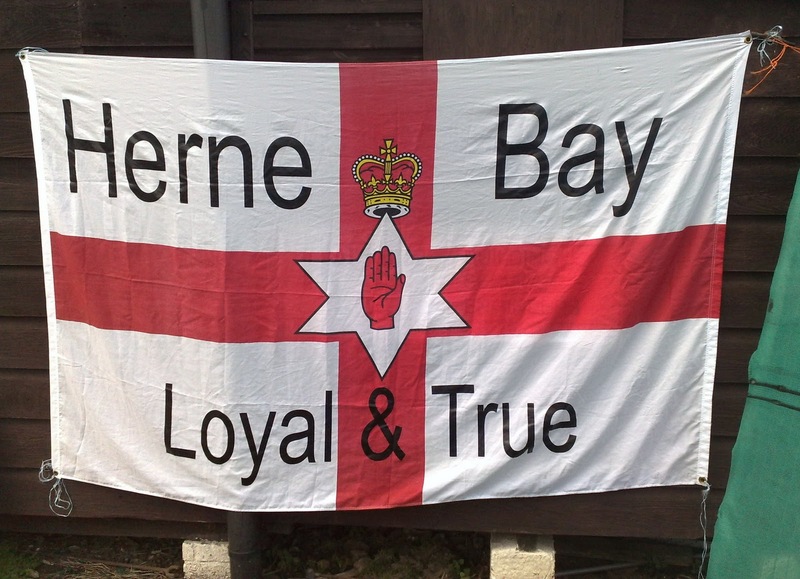 Alternatively, a stay-over there when MUFC Ltd are playing in Kent might be an option. 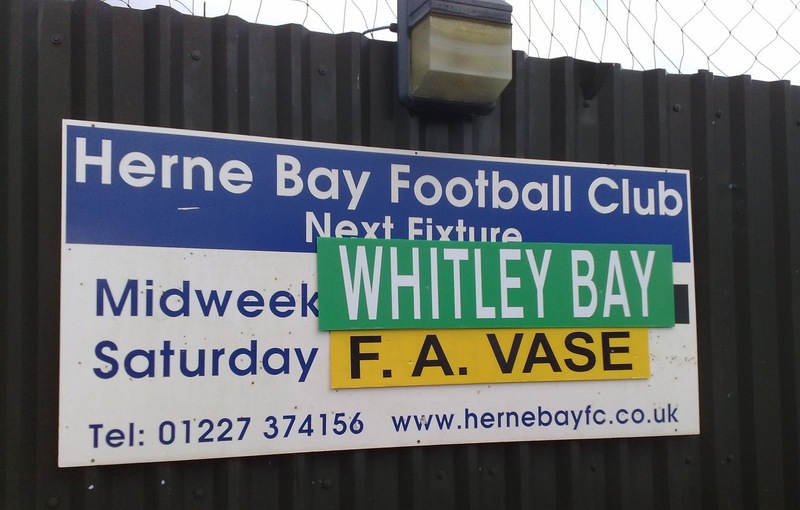 In any case, of more immediate interest is tomorrow's Vase draw (featuring Whitley and not Herne Bay ... unluckily so, from the Kent side's point of view) and the news that former Maidenhead United-favourite Steve Hale is now the manager of Northwood Mark's local side (surely even Steve H can work that one out?!). Yet more fixtures to fit in ... time, Macleod (M), to get those Leeds United tickets on eBay! Would you believe the word of an Ebbsfleet United steward? Interesting thread on the Conf South forum earlier this week, following a bizarre post on the Thurrock forum by EUFC Chairman Phil Sonsara (who has yet to respond to several recent letters, addressed directly to him, from individuals and also from Maidenhead United Supporters Association), encouraging Thurrock fans to attend the Ebbsfleet home game on the Saturday later this month when the Essex side are due to be playing against Maidenhead United FC Ltd at York Road. Seems as if we aren't the only ones to find them to be complete tossers, then?? 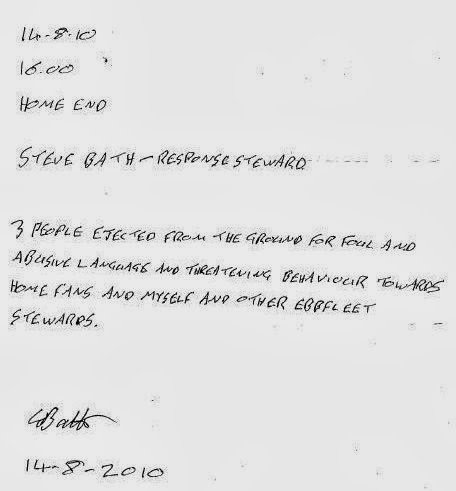 PS > Note that, unlike the Head Steward (one S. Bath), I can spell 'Ebbsfleet' correctly. ^^^ Scarves aloft for the club anthem, which sounds like a Scottish folk song!